Earlier this month the inaugural Dream Keepers Ball was held to benefit the Champions for Children. The ball began with a reception and then included entertainment and a silent auction. 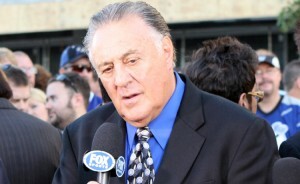 One of the guest speakers at the event was none other than NHL Hall of Famer and Tampa Bay Lightning founder Phil Esposito who spoke mainly about his career and his bid to purchase the franchise. The Sault Saint Marie, Canada native Phil Esposito played 18 years in the NHL for the Chicago Blackhawks, Boston Bruins, and New York Rangers. While playing with the Bruins, Esposito would become the greatest scorer in his day by becoming the first NHL player to score 100 points in a season, a feat he would accomplish five years in a row from 1971 to 1976. After going on to play for the Rangers, Esposito would score his 600th goal and finished his career third in assists and second in total goals and total points in 1981. In 1984 Esposito was elected to the NHL Hall of Fame and then three years later had his number seven retired by the Boston Bruins in what was a very emotional ceremony. After a few years of occupying the general manager role and numerous trades he orchestrated for the Rangers, Esposito co-founded the Tampa Bay Lighting by winning the bid for the expansion team. Esposito is still in the NHL today and is currently the Lightning’s color commentator and co-hosts Sirius XM’s NHL Network radio channel. Earlier this month, Phil Esposito was a guest speaker at the inaugural Dream Keepers Ball that helped the Champions for Children organization. The event had a great turnout that included over 170 attendees and a silent auction to help raise funds. If your company is interested in finding out availability and booking fees for a NHL Hall of Famer such as Phil Esposito or other sports celebrities for a Keynote Speech, Fundraiser Event, Guest Appearance, or Football Camp, call us at 1-888-246-7141.